It’s no secret that a well designed building is easier to build and more enjoyable to live in. There are a lot of things that need to be considered to achieve a quality design. Much of the information you will need about the structure will come from the homeowners, or from your own desires if you are an owner/builder. Where to place the bedrooms in relation to the rest of the house, how many bathrooms, how many bedrooms, etc… These are all very obvious and important pieces of the puzzle. What people often forget is that if you make the builder’s job easier by really thinking through the design, he or she will thank you for it in the end and so will the homeowner. Experienced designers know to create a home in relation to the “module of construction.” This means that if you are building with plywood, build to 4′ increments, or as close to that as you can. The builder will be able to save time and materials if the module of construction is closely considered. With straw bale construction the same is even more true. 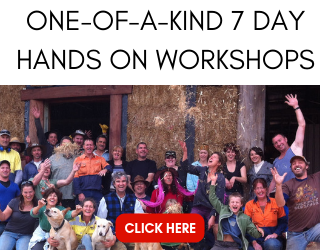 Consider the time difference between cutting a few sheets of plywood and retying 40 bales. The latter consumes considerably more time and energy. You can eliminate this waste by designing the home to the size of the bales. 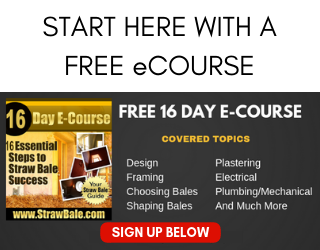 The first step is to identify the bales you will use in construction. A common mistake is to glance through a straw bale reference book and find the page with the dimensions of a straw bale. Do not do that. Many different baling machines produce many different bale sizes. If you design your home to a bale size of 14″x18″x36″ and then find that the bales available to you are 16″x18″x45″, your pocket book, and your builder’s back will be very unhappy. The width of the welded wire mesh. Different roll sizes are available. Window placement, and intersecting partition walls. How will these things affect each other and the rest of the design? Additionally, the locations of plumbing and electrical systems in the structure become much more important in a straw bale home. Keep the plumbing out of the bale walls whenever possible. Run wet plumbing and vents through interior partitions. Use a watertight sleeve around any wet plumbing that must be placed in a bale wall. Avoid using Romex or other sheathed wiring. Use electrical conduit and pull wires so that upgrades can be made in the future without having to destroy plaster. In general, remember that straw bale construction is not the same as conventional construction. 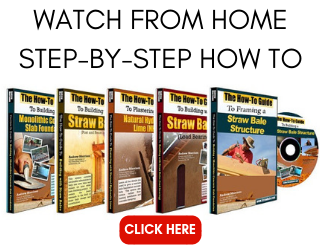 If you are used to building with 2x4s and plywood, get some tutoring in straw bale construction before you bid out a job and start building with bales. A simple call to a qualified straw bale construction and/or design consultant could save you multiple thousands of dollars. I once came onto a job site after a conventional contractor had started building without an understanding of what he was undertaking. Unfortunately, the homeowner didn’t call me early enough to flag the problems and an estimated $34,000 was required to remedy the mistakes. A small amount of time, money and effort at the beginning of the job can save you mountains of headaches and cash later. Pay attention and think far ahead. The more you can predict, the more the home will flow in construction and in life.